I've decided to try my hand at a Let's Play, but there are a ton of Let's Plays out there on well-known games. Rather than begin my LPing on a popular game, I am going to start with an obscure one. 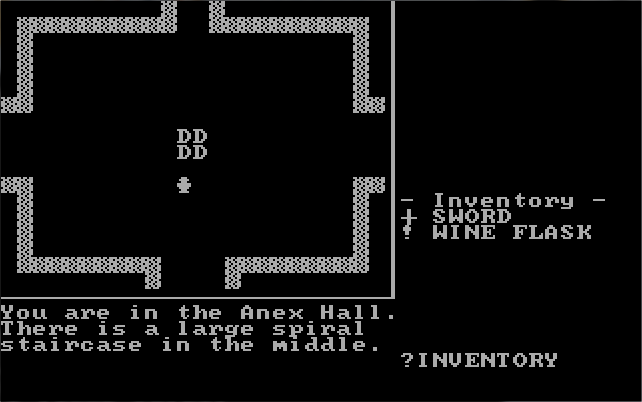 It was one of the first freeware games out there, created by Kevin Bales in 1984. No one knows where he is anymore. He made this game when he was 14, so I assume like most people remembering what they did back when they were 14, he's hiding due to being embarrassed from making this game. Get a good look at that picture. That's the best graphics in this game. This is one of the first clones of Rogue as well. 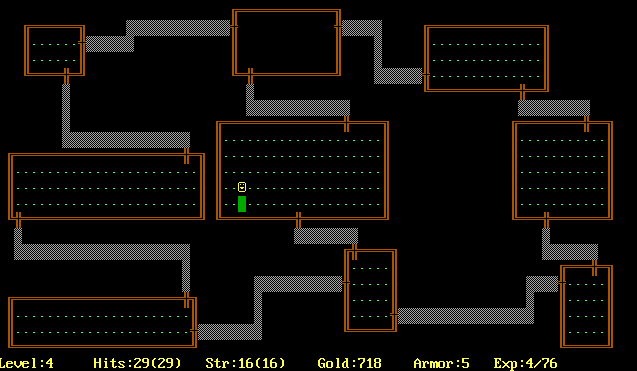 Then again, Rogue isn't exactly the best looking game either, but we're here to play Castle Adventure. Castle Adventure has a story to it. Apparently we've been trapped in this deserted castle and need to find a way out. There are a few quirks to this game though. 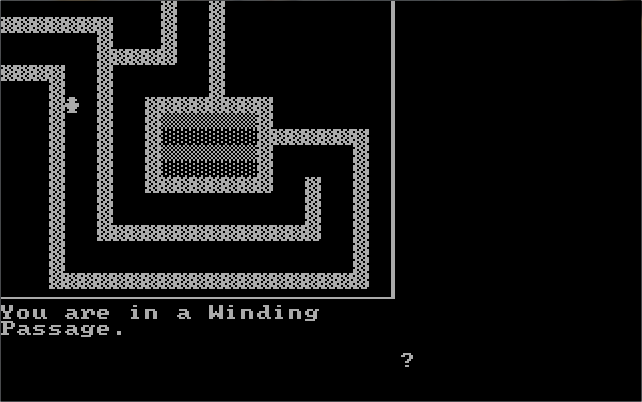 Yes, this is a DOS game, but notice the number of cycles this game is currently running at. The speed at which this game runs is determined by our computer's speed. Running this game at the speeds that modern systems run at will only lead to pain and sorrow. That ugly emoticon from Rogue just kicked our butts at the speed of Sonic the Hedgehog. If you want to play a more challenging game, feel free to crank the speed up. However, 275 cycles is roughly the speed at which DOS computers ran in 1984, so that's why I have chosen that speed. 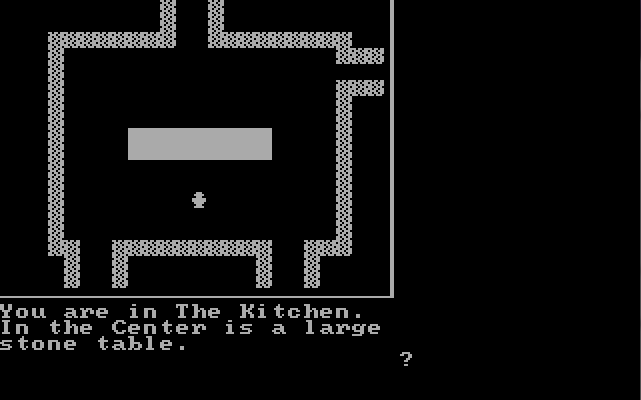 But this was a game that my dad had on his old IBM PC and it was one I've played in my youth and found enjoyable. 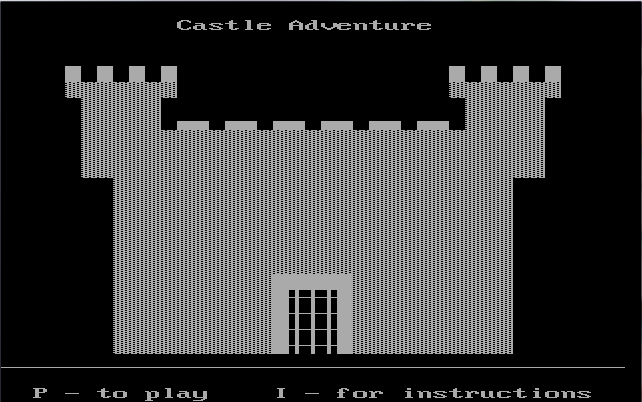 I even escaped the castle once when I was a kid by glitching the game! Well, then... into the breach! We find ourselves inside the castle courtyard, but see that little thing in the courtyard. It's locked, so we are stuck here. 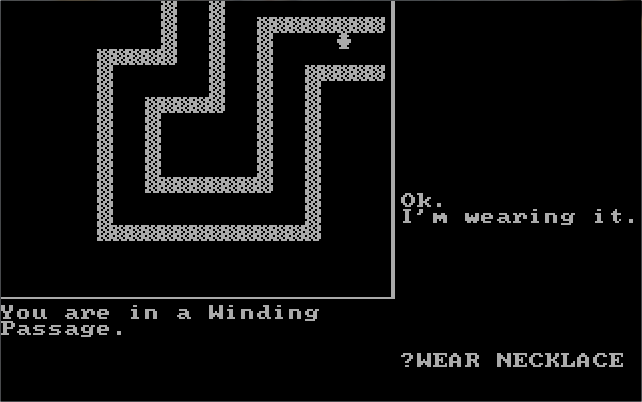 Anyone notice the text parser in this game? 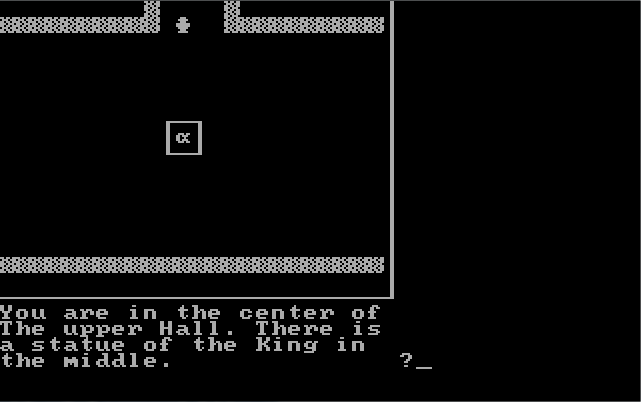 This isn't just a Rogue clone, but a text adventure as well! 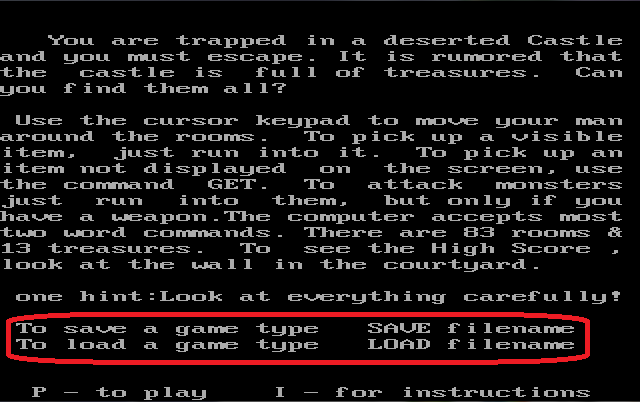 If you all are nice, we'll play Zork next. There is only one direction to go. The entrance room only offers one direction to go also, so we head in that direction. Now we are welcomed to the first intersection in the game! This is where you decide which direction we go: North, East, or West. I suggest not picking West because our friend, the ugly emoticon, is in that direction and we need to find a weapon before we can kill him. Make your choices now! 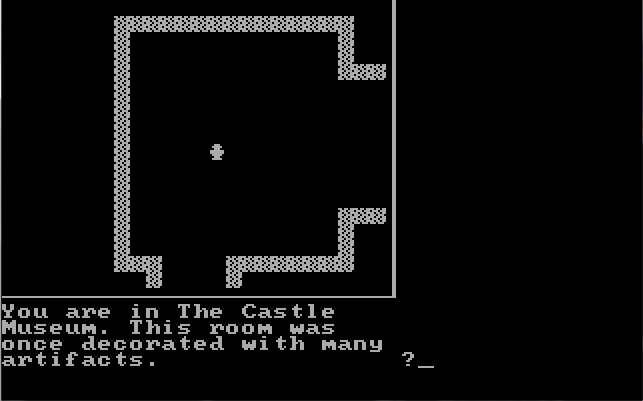 Re: Let's play an Adventure in a Castle! Because my country is in that direction and going north is too mainstream. North, because I like making things difficult. Go East. North is boring and West is overrated. Going west is suicide? oh to hell with that. Head north, guru of games. 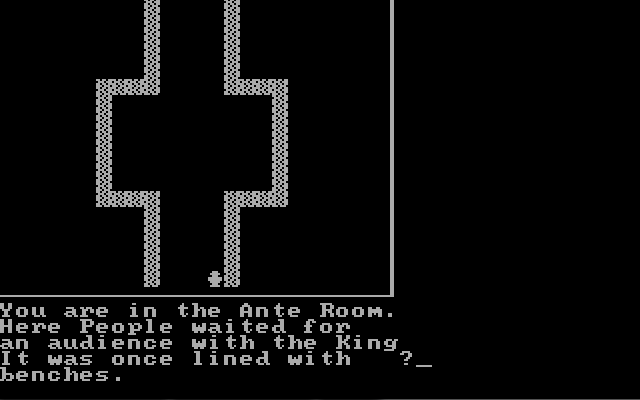 Is this the game that inspired the game that inspired the game that inspired Dwarf Fortress? As for direction, we obviously need to have our sentient Club go north. I suppose east will do. Also, your screenshots have an odd aspect ratio. Everything is stretched out. Looks like we are tied for North and East, but before I decide this, someone here mentioned the odd aspect ratio of the game. Apparently, the game was designed to stretch that way. What those screens were emulating is the default graphics option for DOSbox... Super VGA. 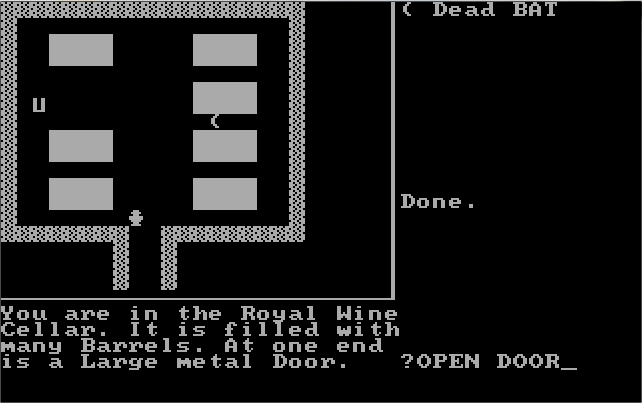 Most of the machine options for this game in DOSBox will give the game a stretched out look like that with a few notable exceptions. Going VGA-only only makes the game look even crappier. Don't use it. 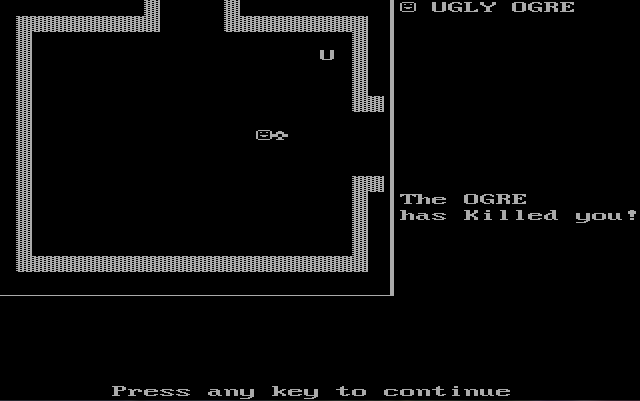 The ogre still looks like an emoticon. Well, two out of three ain't bad. Apparently, Kevin Bales was a Tandy Computer Whiz Kid, which is another thing for him to be embarrassed and go into hiding about. 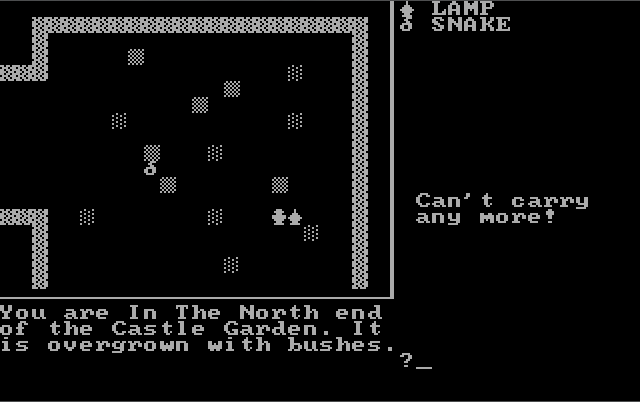 These graphics will also appear with DOSBox emulating a PC Jr. or a CGA machine. However, since this is the best the game is going to look, I'm going to go with this option for the rest of my Let's Play. 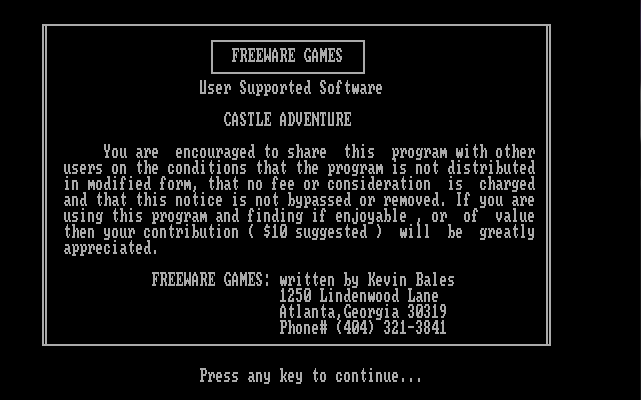 Unfortunately, the screen crediting Kevin Bales ends up squashed in Tandy Mode, so be sure to note that. Well seeing as we are tied between North and East... I'll choose North! Ah, it's the King Emoticon. Run away! Run away! Yeah, we should have gone East from this room. We found a sword! If we are to challenge any creature here, we need to pick up the sword. 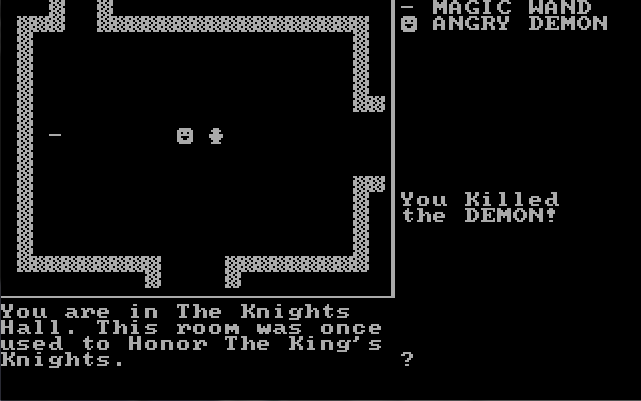 It's very simple to use a sword in Castle Adventure. We just run into enemies, while holding it and praying that they don't kill us first! We find this fancy micron sign. 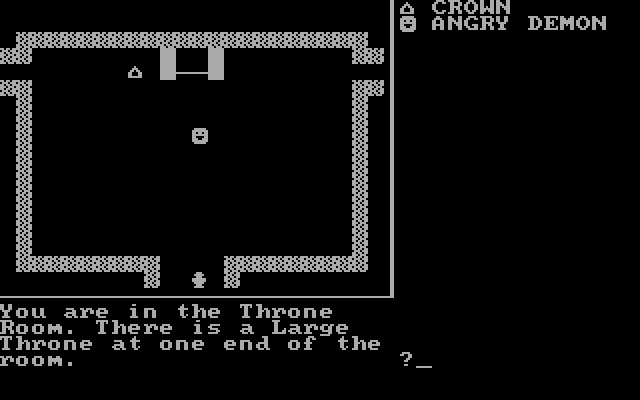 There are many treasures in this castle like this micron and the crown that King Emoticon was guarding. However, unlike most heroes, we can only carry six items at a time, and have to drop one if we are to pick another up. To drop something, you type "DROP" followed by the name of the item. We will leave the treasures alone for now. It's ye flask... But we can't get ye flask, unless we are next to the table, which is the black rectangle, and type "GET FLASK"
However, don't do it in real life. Remember that this is supposed to be a deserted castle and deserted castles rarely have clean drinking water. Delicious bacteria-infested water! Maybe the Emoticons clean it daily. Let us hope so. We'll get some more water just in case, though. We need something that can light our way before we can go down there... The U's and D's are supposed to be staircases going Up or Down respectfully. 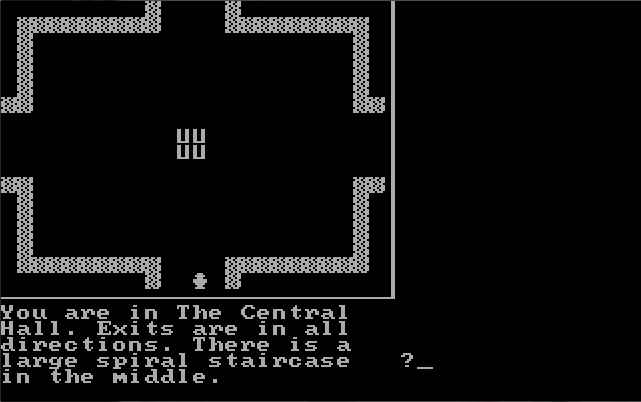 Returning to this room, we can go up its stairs! By typing in "INVENTORY" we can check what we currently have on our person. We have a SWORD and a WINE FLASK. However, now that we are on the second floor, it's time for you to choose again. Four directions this time... North, South, East, and West. You decide! Well thanks for explaining that aspect ratio issue. North. Just keep going north forever and ever and ever. My first impulse would be to head east, so east. We were here, and I had asked you all which direction to go.. The most votes were East, so we head East. We find a helmet... This is one of the items that aren't treasures, along with the flask, that we can use but don't actually need to escape. If we wear the helmet, it will protect us from damage by the creatures in the castle. We'll take it for now. In actuality, many of the items we needed were in the different directions that you had to choose... If we go West from this room. We find another angry emoticon, but also a magic wand. Apparently, we're a multiclass Warrior/Mage. The necklace will be in our inventory. The Necklace is one of two treasures that are also useful in the castle. 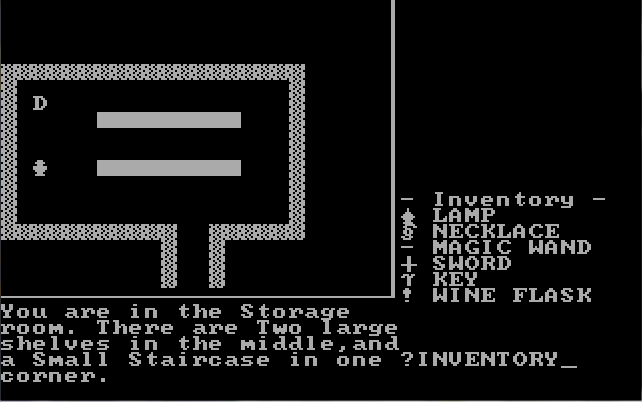 The importance of treasures is in determining your final score for when you escape. We'll talk about how to get the treasures later. We find a vampire... 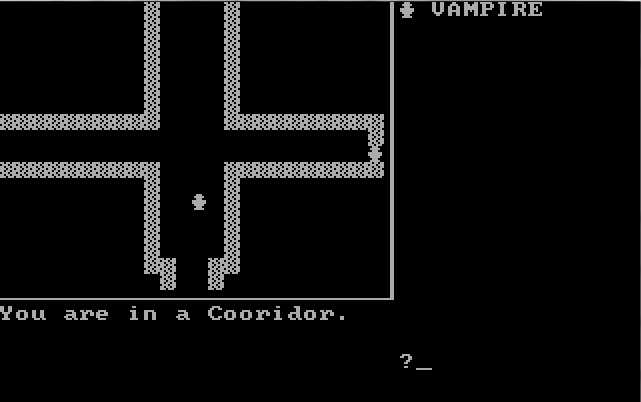 Apparently it's sleeping and doesn't notice us, but because it's a vampire, it can't be killed with our sword. We'll leave him alone for now, and continue northward. We find stairs upwards, so let's go up. We find another stairway upwards, so let's go up. We finally find something different. To the West is a division sign blocking our path. Like the vampire, we have to find a specific item to get rid of it, but it won't attack us. However, there is a clear path to the East. We are now in the King's Study, but by typing in "LOOK DESK"
WE FOUND A KEY?! Let's go up to the desk and type "GET KEY." Let's head back to the entrance. I've got a good feeling about this Key. 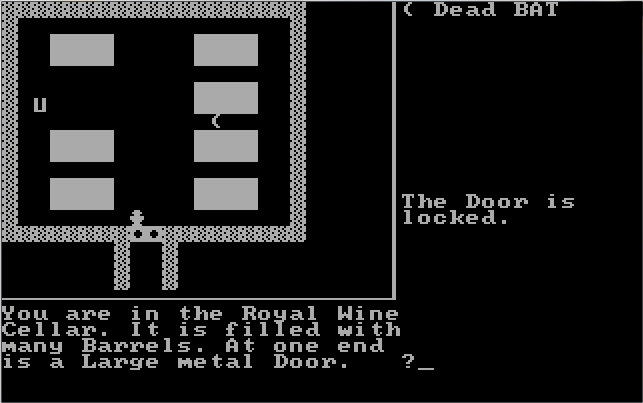 Remember that the castle gate was locked, so let's use the Key on it by typing "OPEN GATE"! The Key doesn't fit. No Interchangeable Antimatter Keys in this game. But it said it was locked magically so what if we use the wand? 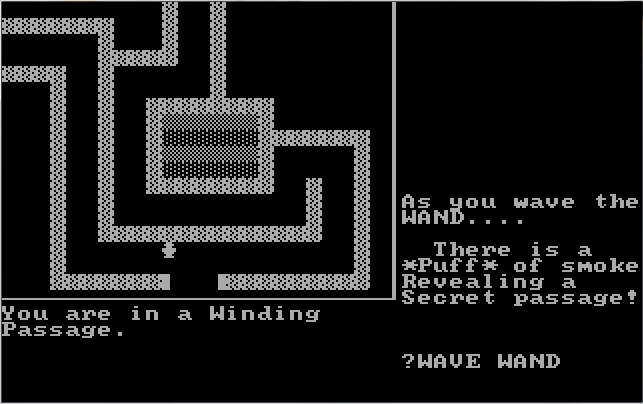 Let's type "WAVE WAND." The Wand doesn't work. Apparently Kevin Bales expected us to try to unlock this with both the Key and the Wand. However, now that we are on this floor... There is one more item we need. We can't pick it up as we can only carry six items at a time. Remember that to drop something we need to use type "DROP" followed by the name of the item. It is the Helmet and the Flask that we might not need in the future. The Helmet protects us from damage while the Flask can heal us with water. Everything else we will need... Will we take the Helmet or the Flask downstairs with us. Choose wisely. Hmm... I'd probably go with flask. Just to let you all know... I'm going to be away from the internet starting August 1st for about a week to visit my grandparents. Letting you all know ahead of time. I may only get one additional update in before then. It's been a while, hasn't it? Well, sorry for taking so long to get this up, but I had been busy with school stuff and so totally not playing Tomb Raider, so let's get going. Everyone wants me to keep ye flask so I'll keep ye flask. We've also headed back into the storage room. After killing a goddamn bat or possibly a magical boomerang, we find ourselves in a room with a door... It is here that we needed the key. By typing "OPEN DOOR" while holding the key, the door magically disappears! We will now abandon the key at this point since we no longer need it and we do need room for the item we need down here. 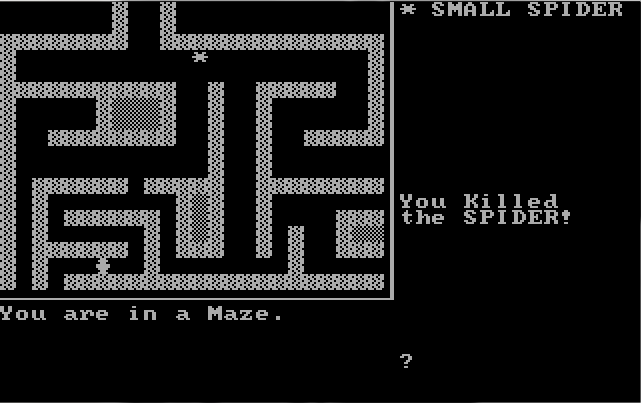 After a long passageway, we are attacked by an asterick spider and find ourselves in a maze. 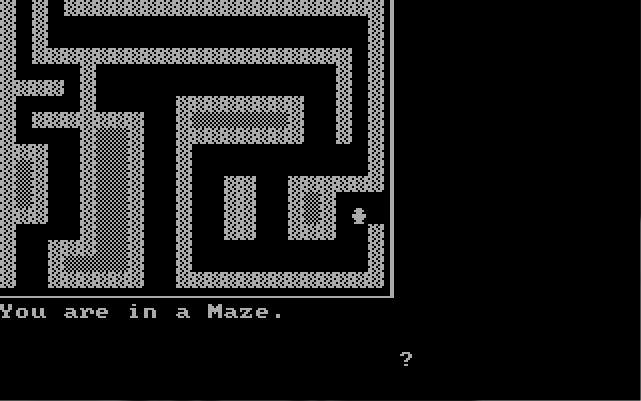 I've position my character on the path that we should head through the maze. 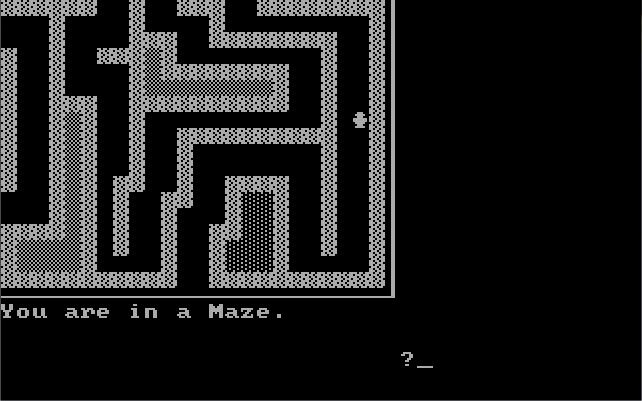 We will be in this maze for a while, but we do need to go east from this screen. We need to head down the path guarded by the Big Spider. Also, my character can look through wall! There is only one path we can take so we head south into a winding passage. It's here where I decided to drink the water from the flask and wear the necklace. As I've said before, the necklace is one of the two useful treasures in this castle. The necklace protects us from the traps that are up ahead. The next one is up ahead. 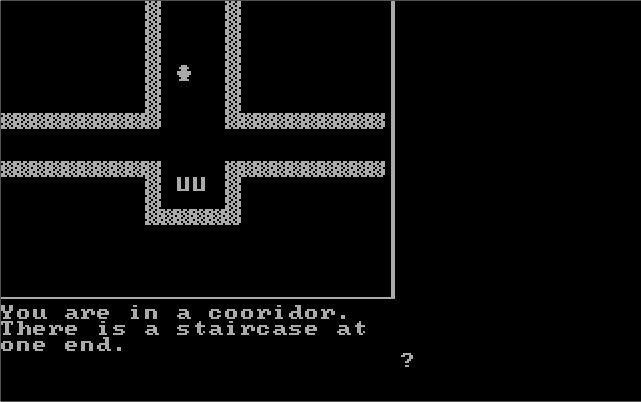 Now the first inclination would be to head down the path and go upwards, but... we have yet to use one of the six items we've gotten, so... let's use the Wand right here! 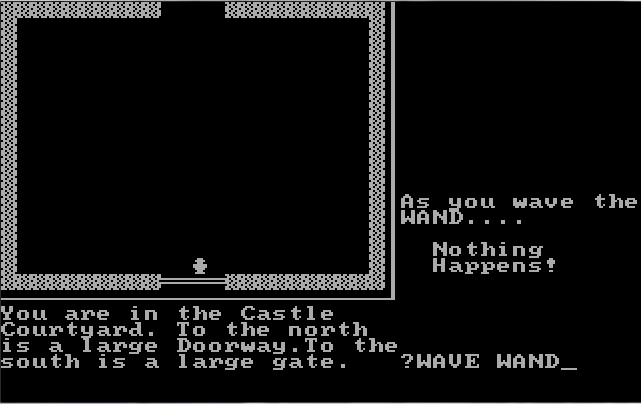 By typing "WAVE WAND", we find a secret passage leading south! In this passage is the Scepter. The Scepter is the other useful treasure, in that it is what we need to escape the castle itself. We need to head back through the maze and the way we came to the room that we started this adventure in. 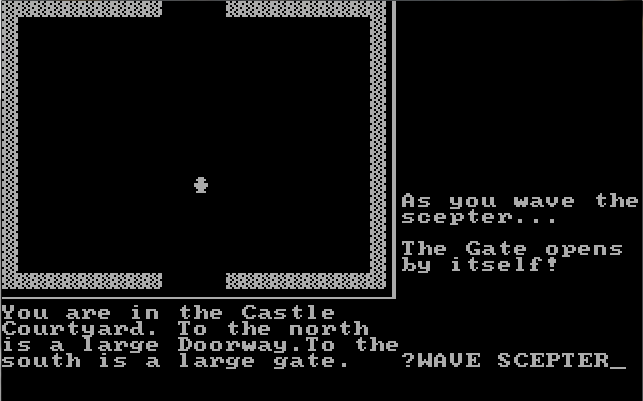 By typing "WAVE SCEPTER", the gate to the castle disappears! We can just walk out! Note the spelling error on treasures... However, 900 is a poor score... so should we go through the castle again to get some of the "treasues" now that we know how to escape, or should we end the LP here and let you all figure that out for yourselves. I'll let you decide, if you are still there.